From what I understand as well the ION has arms at some parts, and also seems to be not separated from the road in some parts as well. The valley line SW doesn't have any signal arms and is always separate from traffic or at least is on a part of the road that does not allow traffic to be on the same lane as it. Last edited by danimori; 09-04-2018 at 01:32 PM. Trans Ed said they will use whatever system is in place at the time of the line's opening. Fare regulation is up to the City. City's is aiming for 2020 launch. So, finger's crossed? Yep got a bunch of responses from them which is generally filler. The strange point is it doesn't seem that there are real provisions for smart card readers being built in now, I don't look forward to whatever Gerry Rigged solution people get forced to use. Our current system is a "honour system", so there are no turnstiles, you can just walk on with/without payment or bus pass. The Vix contact has been signed, so I can only assume installation of the Vix smart fare system would coincide with opening of this Valley Line leg, and if not, one would still be able to use the existing honour system. I agree it would be boneheaded to open the line without smart fare since the City is in talks at the moment and slated for release in 2020. I'm not sure if its completely clear but the vehicles following here are only their because this video was early testing. The trains do have turn signals and break lights with that said. Speeds are faster than this as well, the best comparison I can give is that the trains have similar top speeds to buses but accelerate quite a bit faster. They accelerate faster then our current diesel buses. A transit driver told me the old electric trolley buses had gobs of torque for acceleration, which she loved. You can probably get similar acceleration with a modern diesel electric hybrid bus. 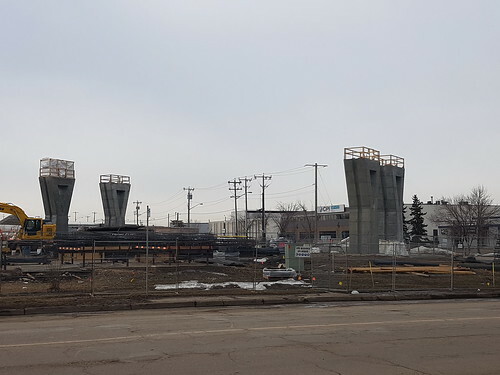 Looks like the North Saskatchewan tunnel portal is done, as well as the tunnels. Sorry, no pictures, but a good photo opportunity. buses will typically accelerate between 1.5 and 2.0 mphps while lrt will typically be between 2.5 and 3.0 mphps. unlike buses, lrt also doesn’t have to merge with other traffic or resolve the “wait or leapfrog” at stops with more than one vehicle in line. ^ So much for the LRT being a streetcar. Exciting announcement forthcoming today around 1pm. 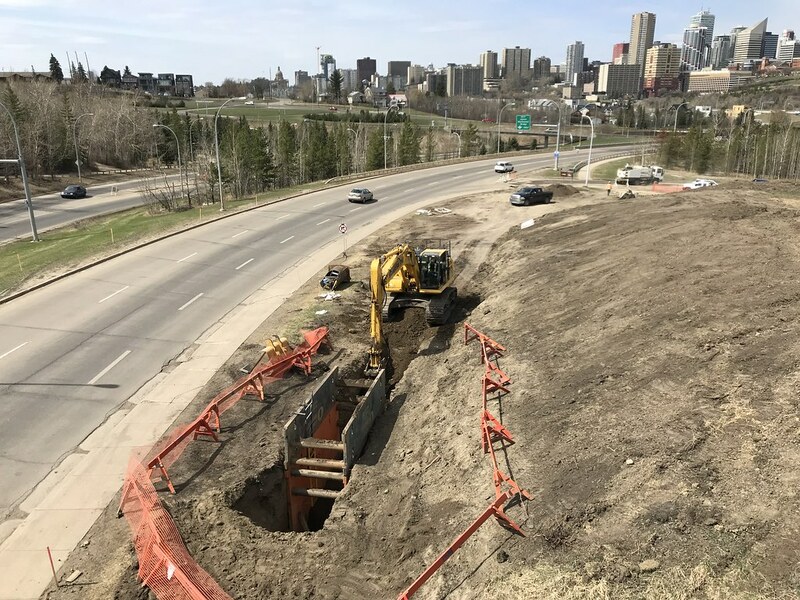 Probably just a photo op for the tunnel breakthrough. Or maybe they've figured out what the giant concrete aberration in the river is? 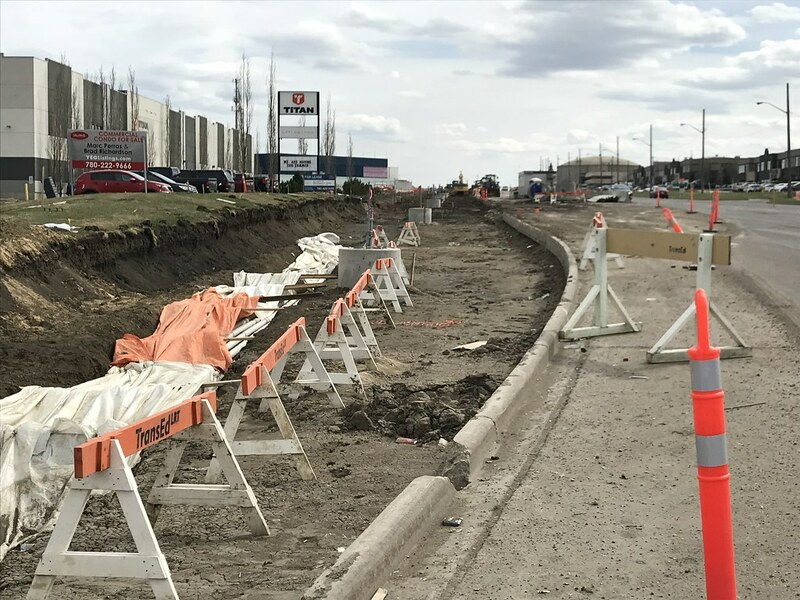 "We've determined that elevating(or trenching) from north of the traffic circle to south of Whyte ave will be more cost effective than the current at-grade option when operating costs are taken into consideration, so we've requested and been granted approval to make that change." So the basic tunnel is now dug from one entrance to the other. So what's next? 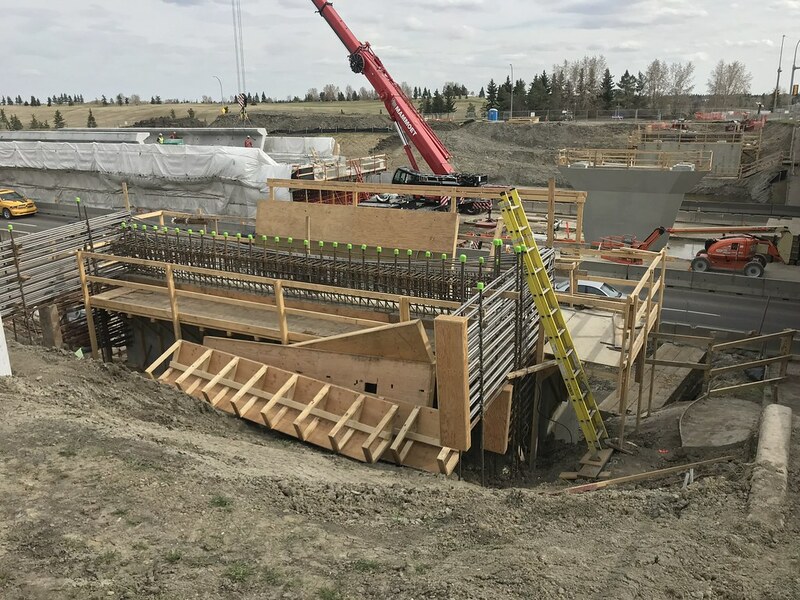 Looks like shotcrete has been installed already. Don't they bring in concrete sections one at a time? Don't they do the shotcrete as it's digging? I recall a video of the Metro line tunnel showing the process. I saw a picture where the monolithic concrete block was being jackhammered. I wonder how the progress was going on that. Good question. So they dig and add shotcrete as they bore? 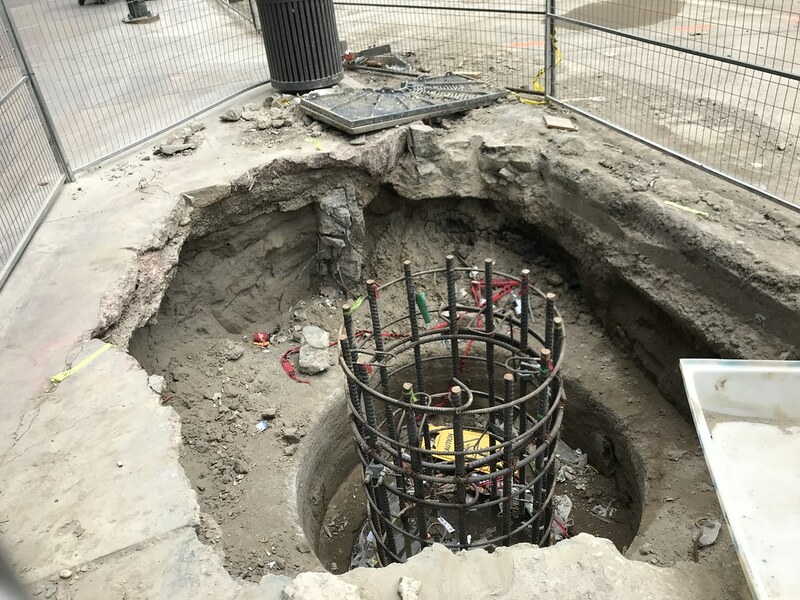 Not sure what you mean but there's been news footage showing LRT pillars in place around Wagner station if that's what you mean. Process used for the NLRT tunnel extension. Last edited by lat; 14-04-2018 at 11:10 AM. 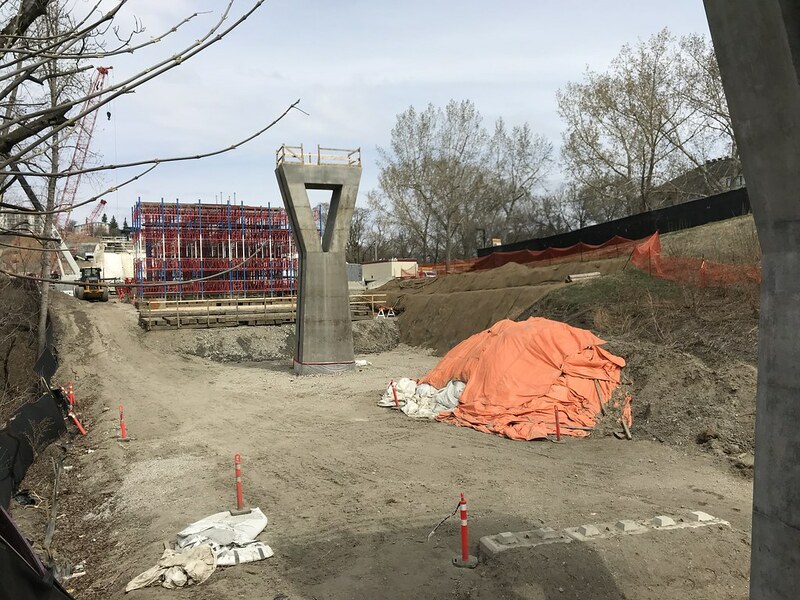 Construction of the Valley Line LRT bridge across the North Saskatchewan River has hit a snag thanks to a partially buried concrete slab. 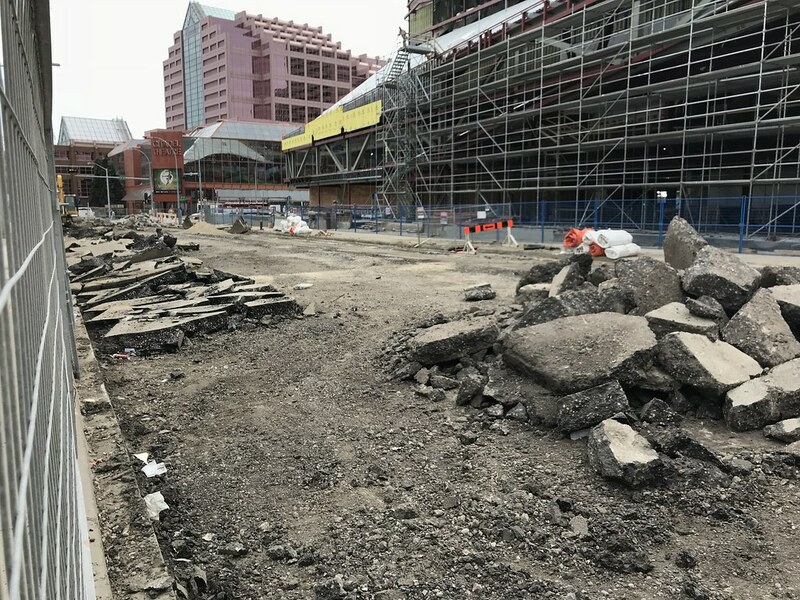 The car-sized piece of concrete is buried nine metres deep under the berm platform construction crews are working on, and underneath the river and riverbed itself, on the north side of the river near Grierson Hill. 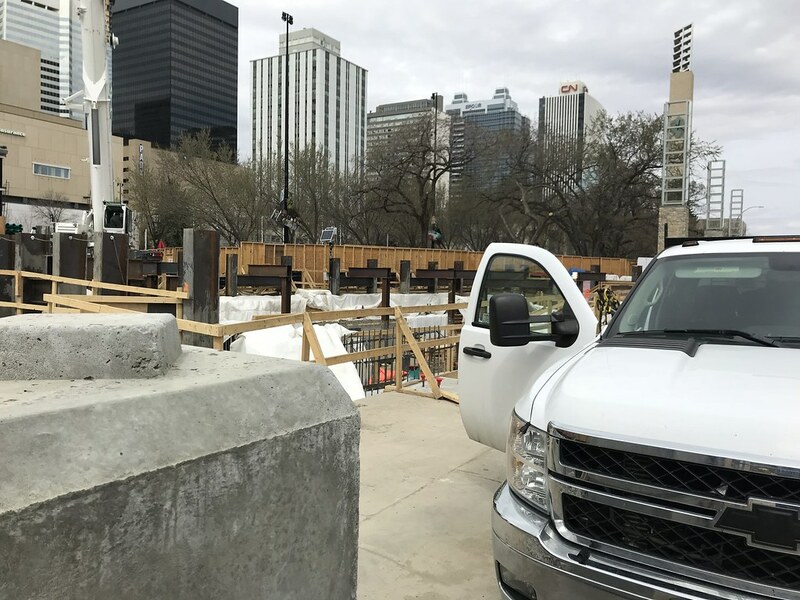 Due to its size, it cannot be moved, so construction crews are forced to work around the obstruction and redesign the construction area. Couldn't you drill and blast to break it up? Which is a shame as it has a major schedule impact on those of us that used the old bridge multiple times a week! Does it? Isn't the schedule for bridge opening unchanged? 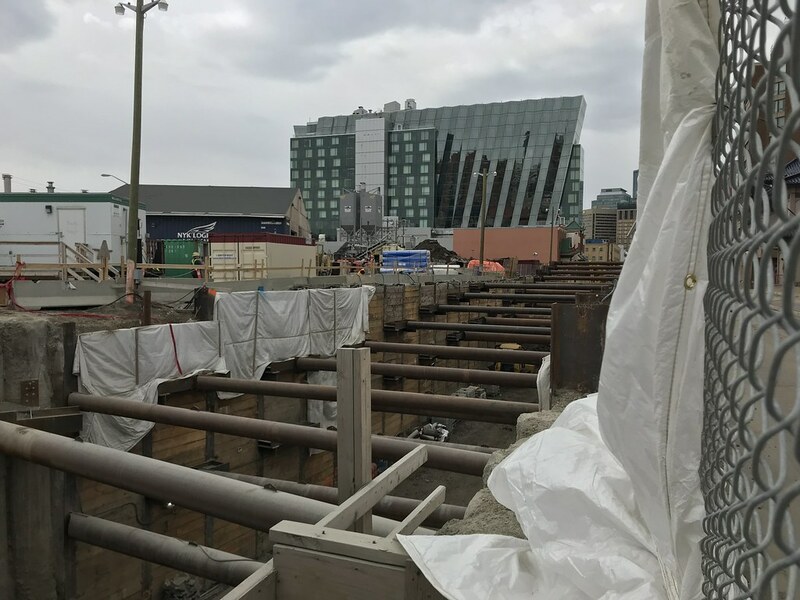 The pedestrian portion of the bridge was supposed to open prior to transit service beginning. This is now no longer the case. 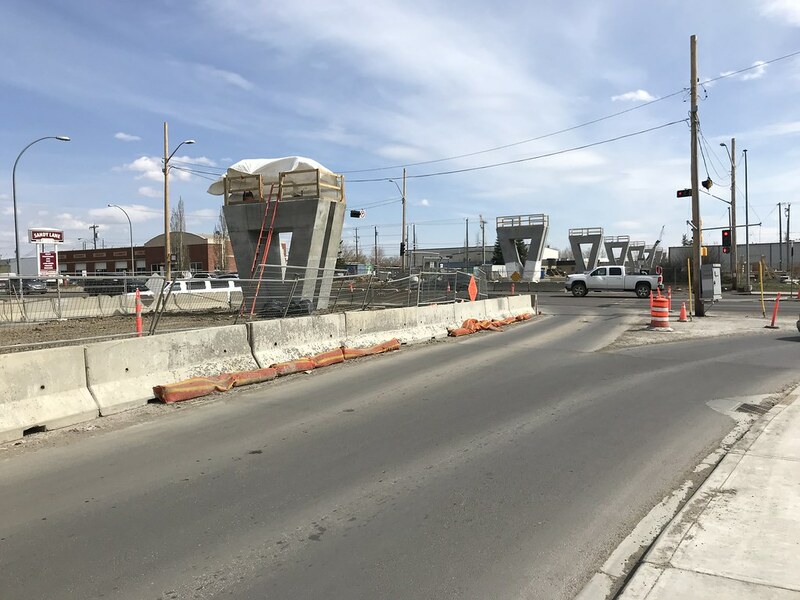 The Tawatina Bridge includes a pedestrian bridge that will now be delayed by “many months” as a result. 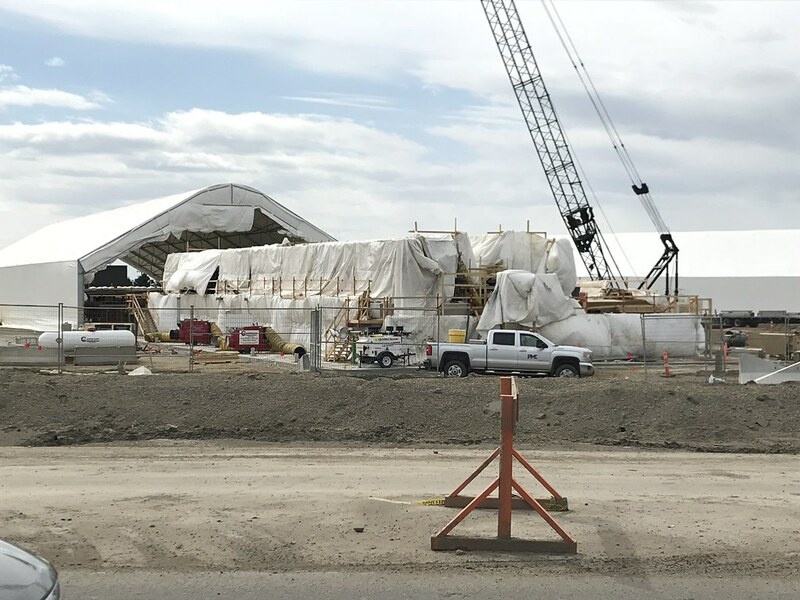 It was expected to be completed by 2019. 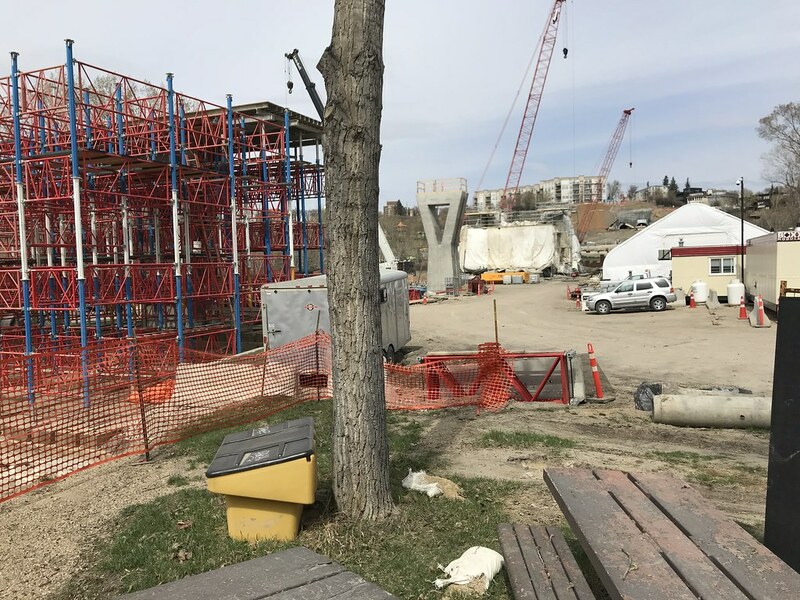 However, the overall construction of the LRT project is not expected to be impacted and crews expect construction to be completed on time in 2020. Southern section of Valley line construction. I'll be honest it still gets me that a lot of the grade separation is wasted when it is only interspersed between at-grade sections. Just wait until graffiti "artists" tag these things first Doctor. 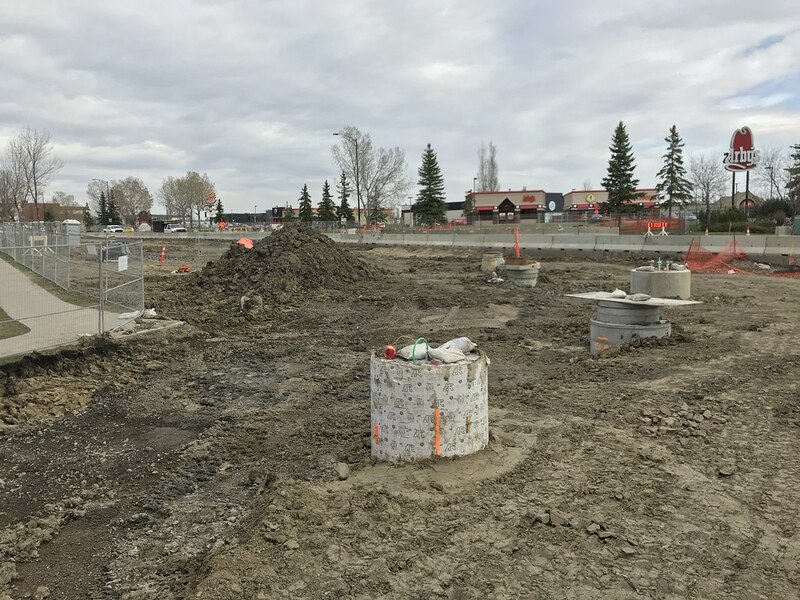 Mill Woods will be busy this spring. One thing I think really does hold true is that a street running section really can liven up an area. Would be nice to see that in these sections of Downtown. Should also get way more people out on the streets. 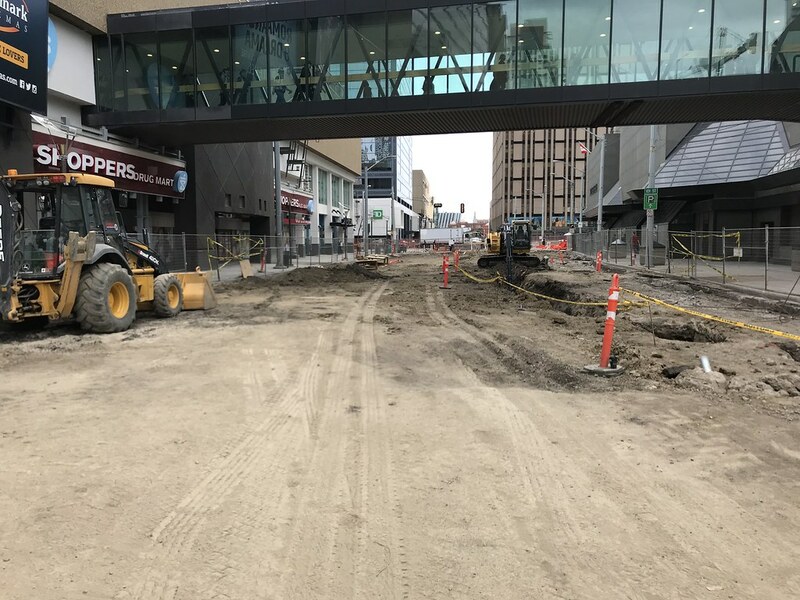 Very true, Reece, especially for Edmonton's Downtown, but even though 102 ave was busy before with lots of bus riders, the core issue was blank walls and interior malls/shops/food court. Lots of good changes happening on all those fronts. I got an answer on Smart Fare on this line and implementation. 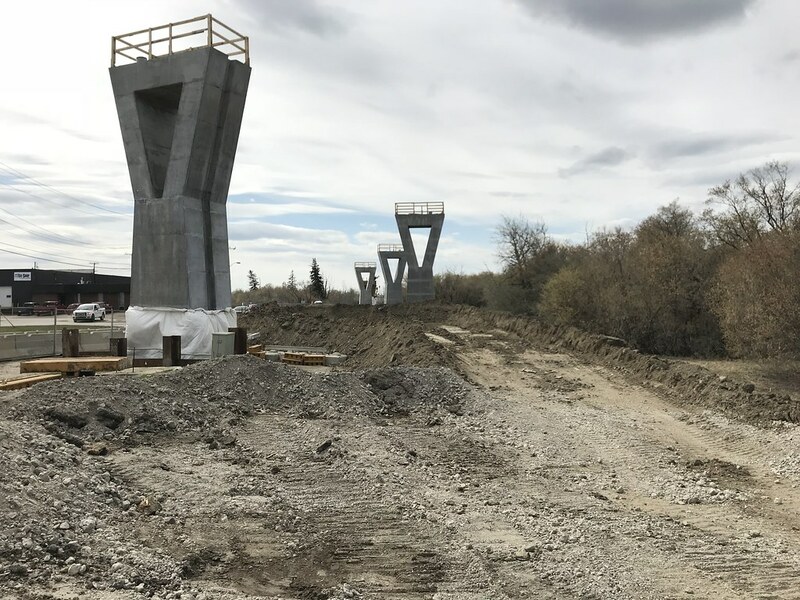 ETS told me via e-mail that the Smart Fare system will be in place by Summer of 2020, and the Valley Line won't be running till - they said - December. So then it better have smart fare! 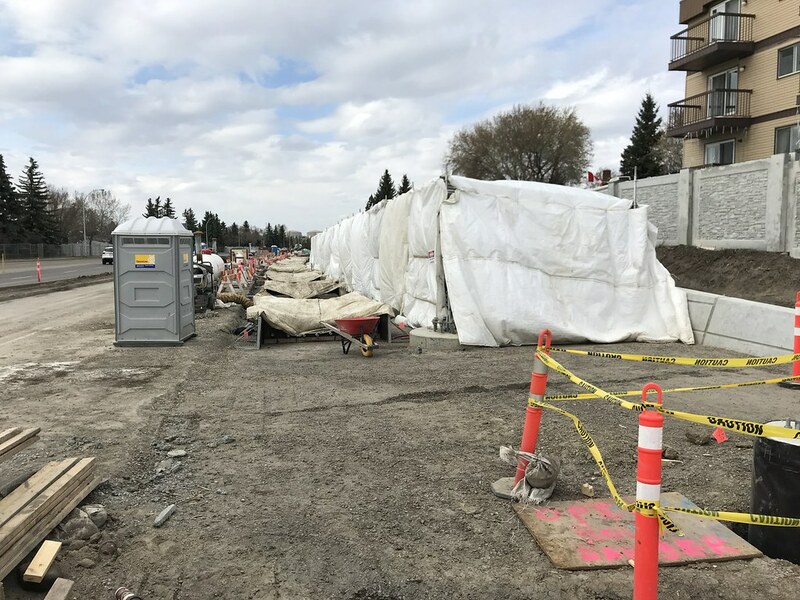 So, I live in Mill Woods, work downtown, and travel by car much of the LRT construction route. 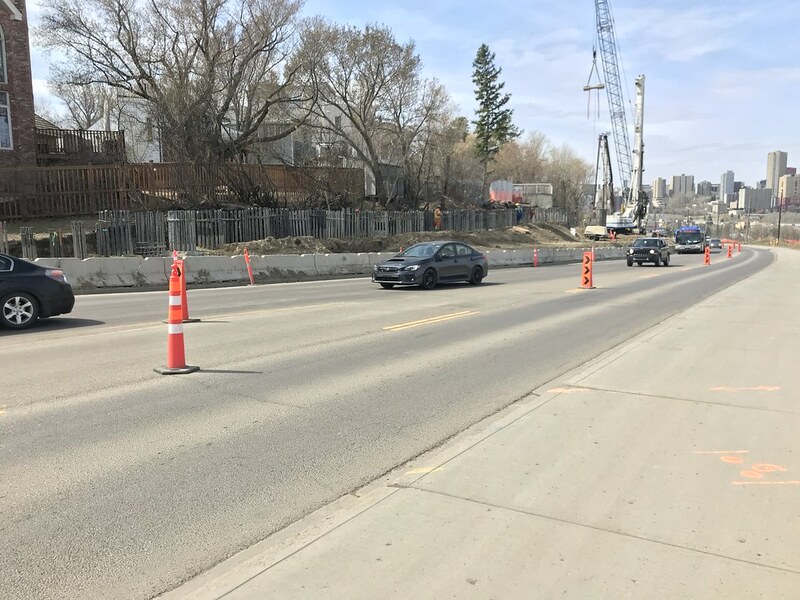 The traffic restrictions now with construction are more significant than when LRT will be running and my commute time has barely changed. I think those that are claiming future traffic “chaos” are full of it. Keep in mind however that the biggest traffic change will be from the extra time at lights due to trains crossing, not from lane closures. It will be interesting to see what the actual changes are. I'm in Millwoods as well. Most traffic exiting is going North at rush hour or taking Henday or Whitemud. 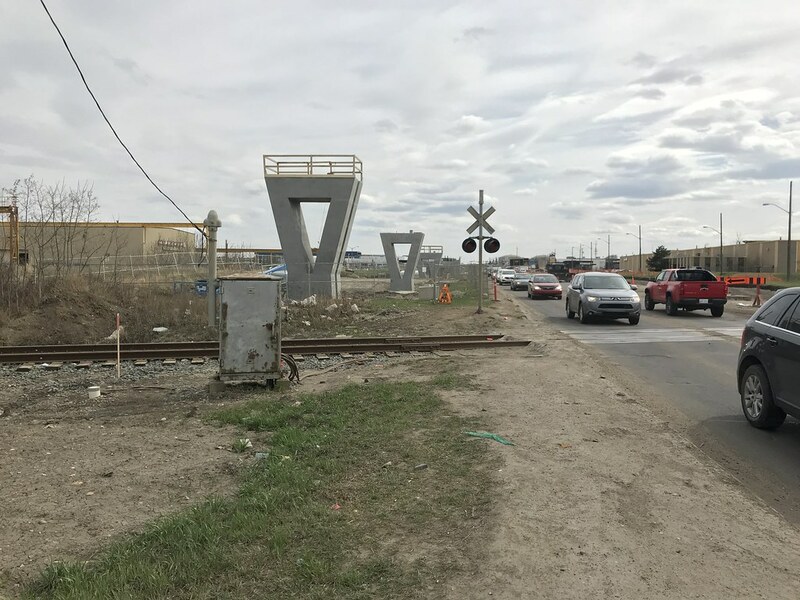 So that the LRT doesn't interfere with that and as with the case of 111th street might even make that route quicker as the ROW gives proprietary lights. I love driving on 111th north or south because you get a train so often through there setting off continuous green lights. Its faster than it used to be as the lights were always poorly timed through there. The problem is in crossing the ROW but people should take better routes. 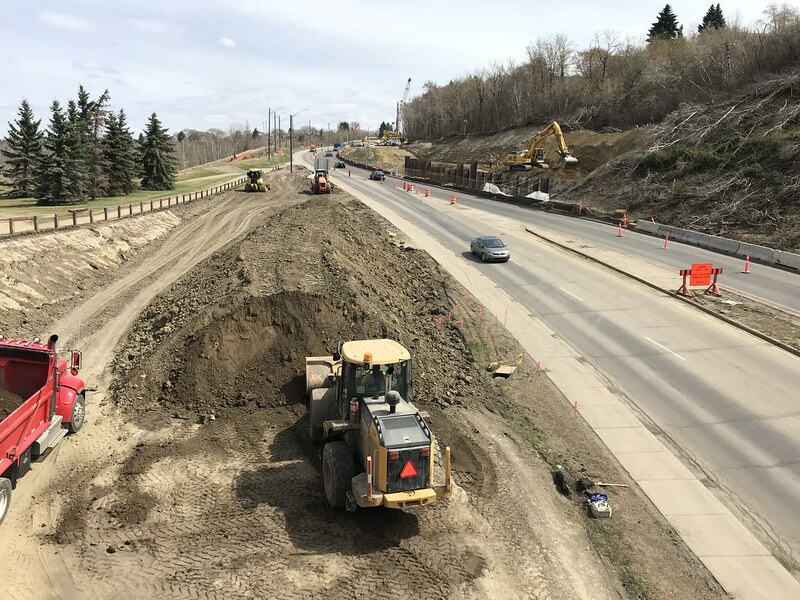 Any of Henday, 23ave, or Whitemud should be used driving East - west. 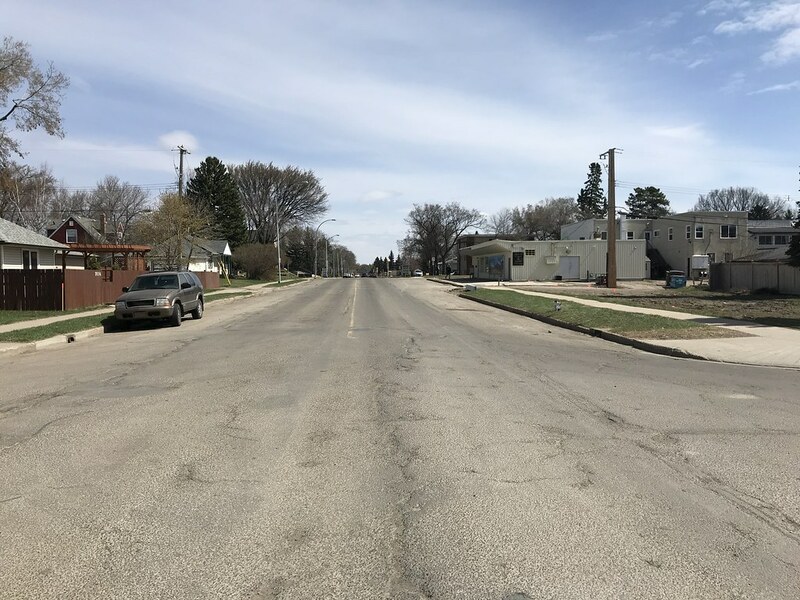 Unless you live in the region its silly to use something like 34th ave.
111th Street is only faster if you happen to mesh up with a train, and that's only good until the train reaches the station, and then you are setup with a bank of red lights. Most times, you don't even mesh up with a train, and its actually a lot slower to drive on than prior to. 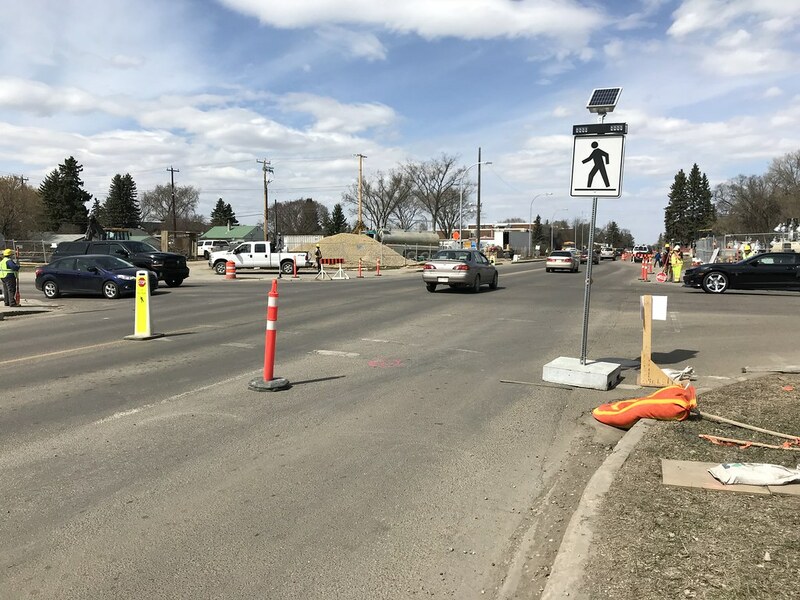 Once you consider how difficult it is to travel east/west across 111th street using 51 ave, or 34 ave, and the long queueing at those lights... it's a bad solution. I'm equidistant from Gateway and 111th. I take Gateway every time over 111/109 to get downtown when the need arises. I'm in windermere. Even just going to Southgate, I'll take gateway over 111, even though 111 is the closer exit to me via Henday. 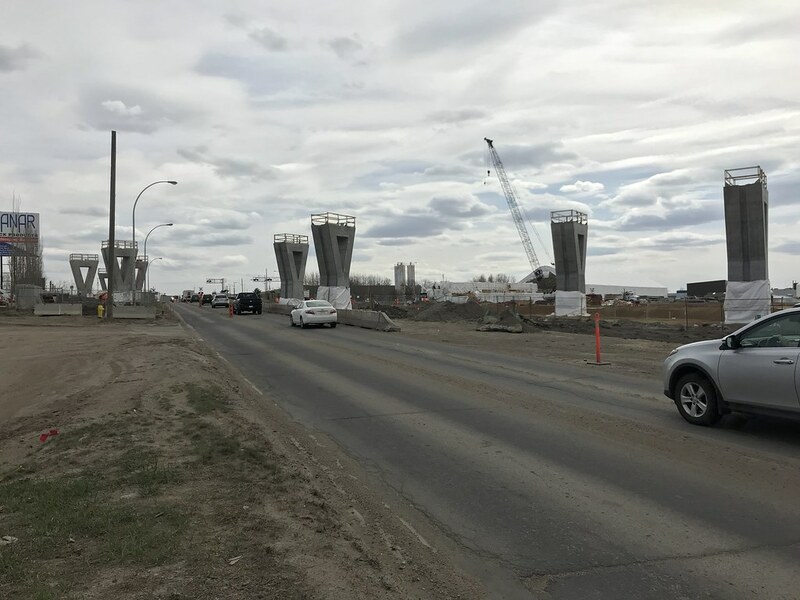 The first set of lights isn't till 34 avenue on gateway, where as on 111 street, there will be at least 10 lights to get to just 34 avenue. 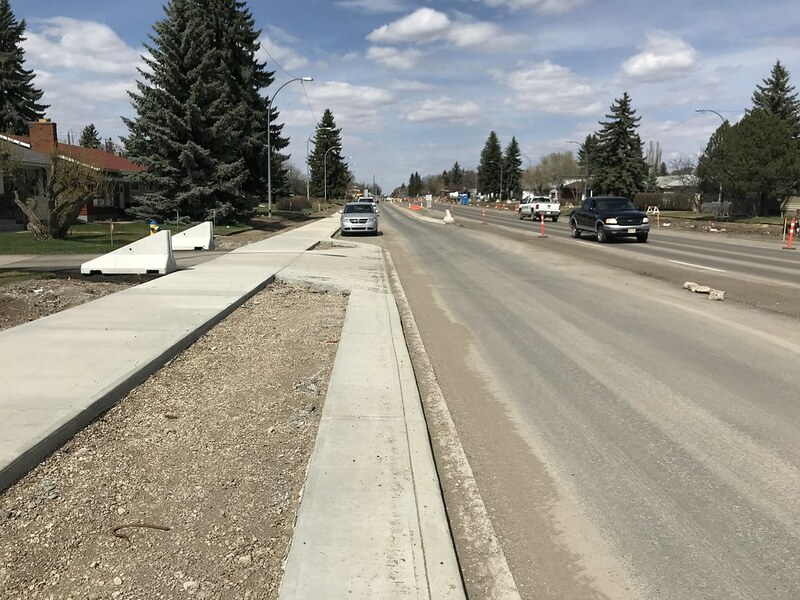 We start off at 102 Street and 102 Avenue where you can see 102 St will be dramatically narrower than it is now judging by the placement of the fire hydrant. 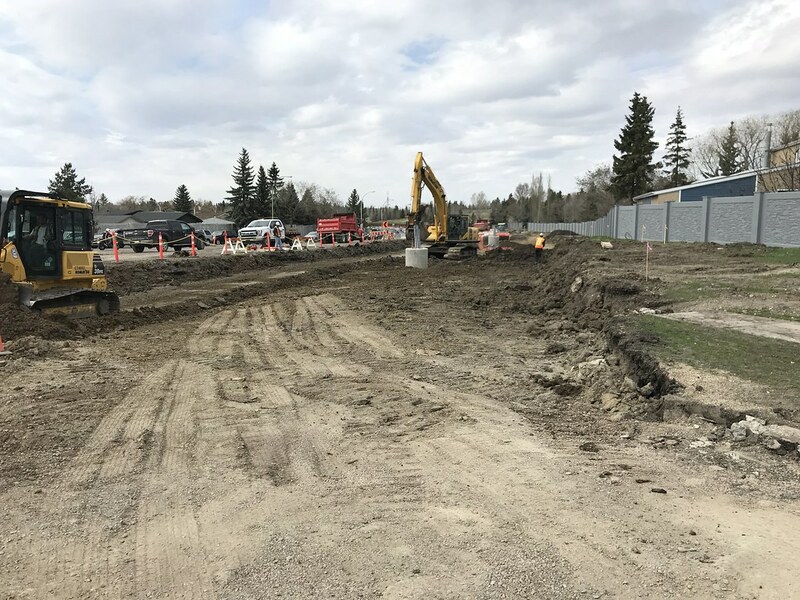 Utility work under way. 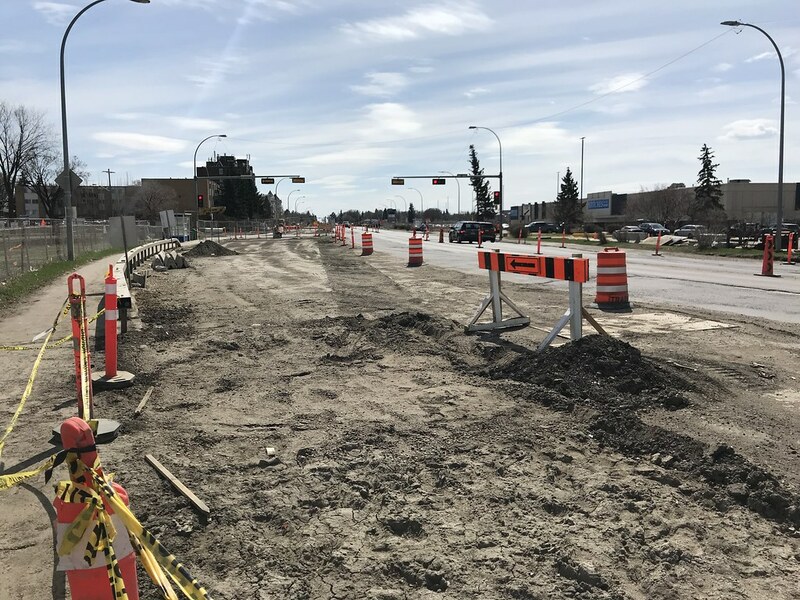 Looking east along 102 Ave at 102 St.
Utility work under way. 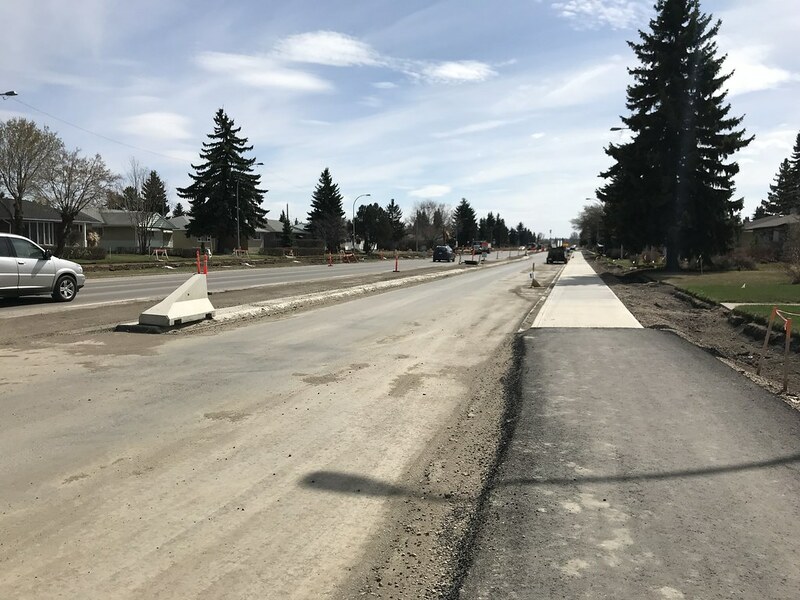 Looking west along 102 Ave at 101 St. 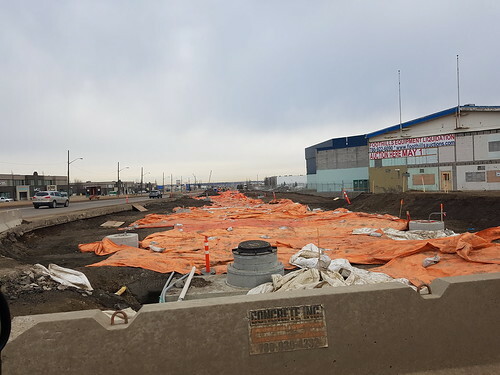 Most, if not all of the rebar for the catenary pole foundations are in place between 101 St and 97 St.
102 Avenue between 101 St and 99 St. Utility work ongoing. 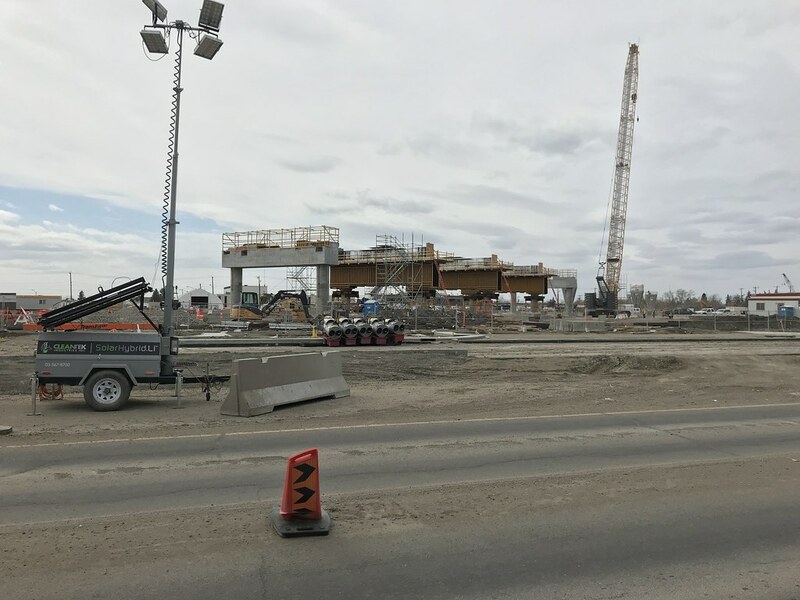 Couldn't get a great shot of the Churchill Connector, but at least this gives you an idea of the scale. The fence at 97 Street has lots of little Chinese tags, in reference to the gate that was once there, I imagine. 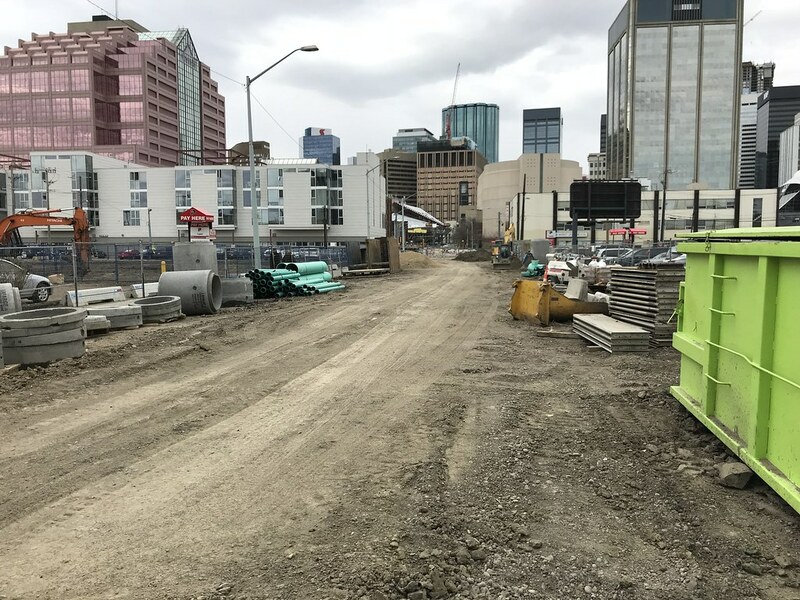 102 Ave through The Quarters looks more like a logging road right now than a proper city street. 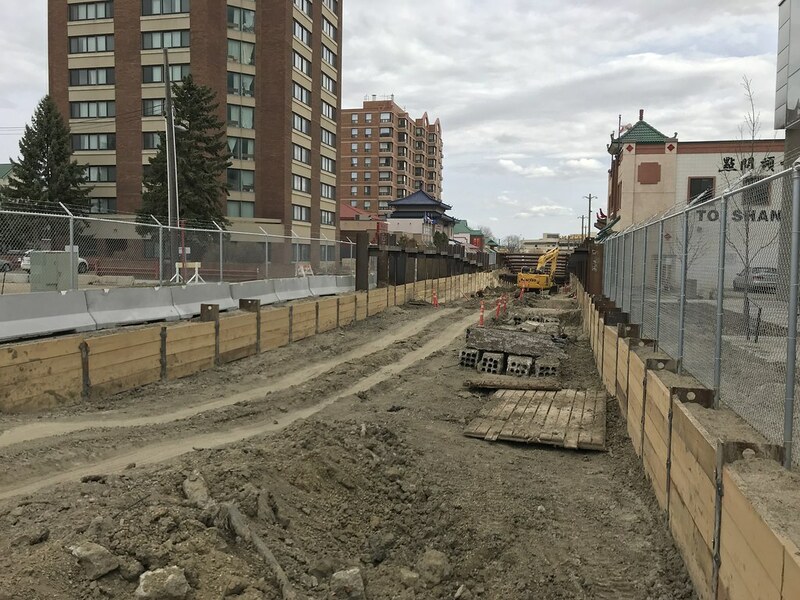 East of 96 Street, the LRT will start descending into a tunnel. 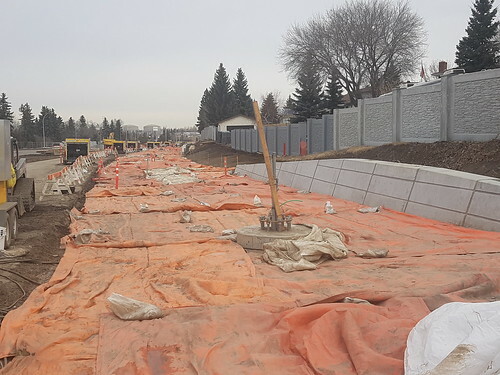 Another view of the trench, this time looking west from 95 St.
Work ongoing at the bridge site. Not too many opportunities for photos here unfortunately. South of the river now. 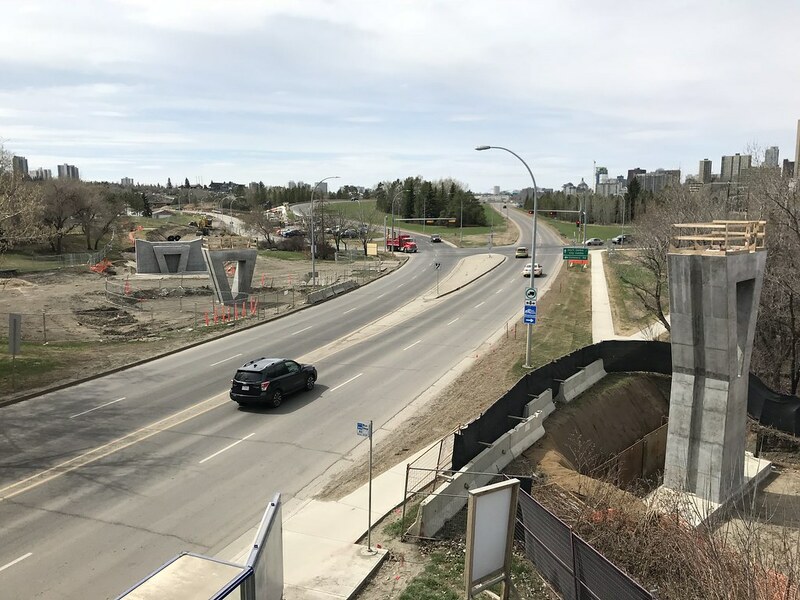 Looking north from 98 Ave.
From the pedestrian overpass over 98 Ave, looking southwest toward the future Muttart Stop. 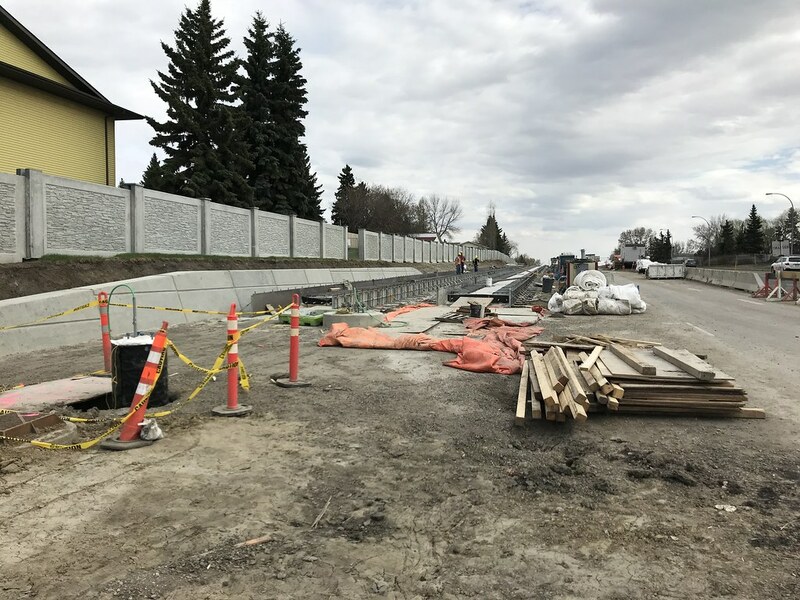 Retaining wall and other work proceeding at the Muttart Stop. 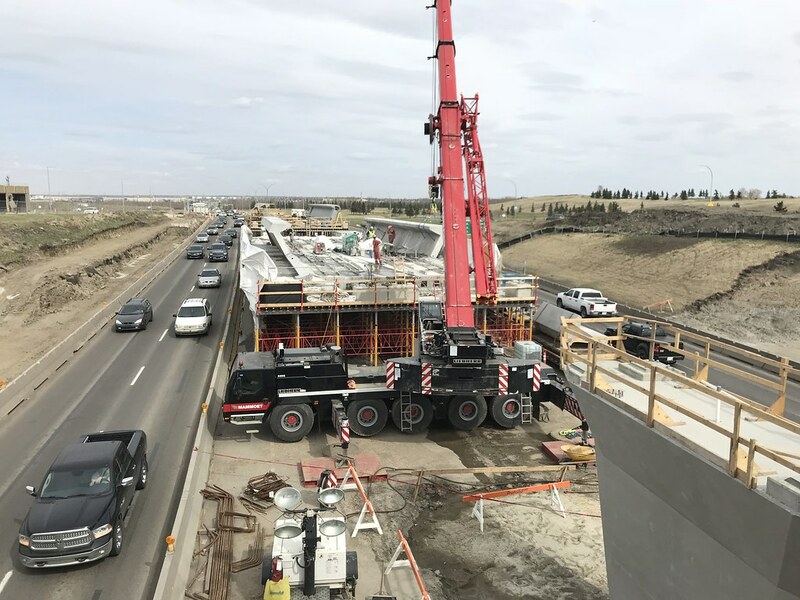 Looking west from Connors Rd pedestrian overpass. Looking east from the exact same bridge. A little further up the hill, crews are working hard to shift Connors Rd over a few metres to the south. Retaining wall construction underway at the top of the hill. 95 Avenue has hardly been touched. Looking east at 92 Street. 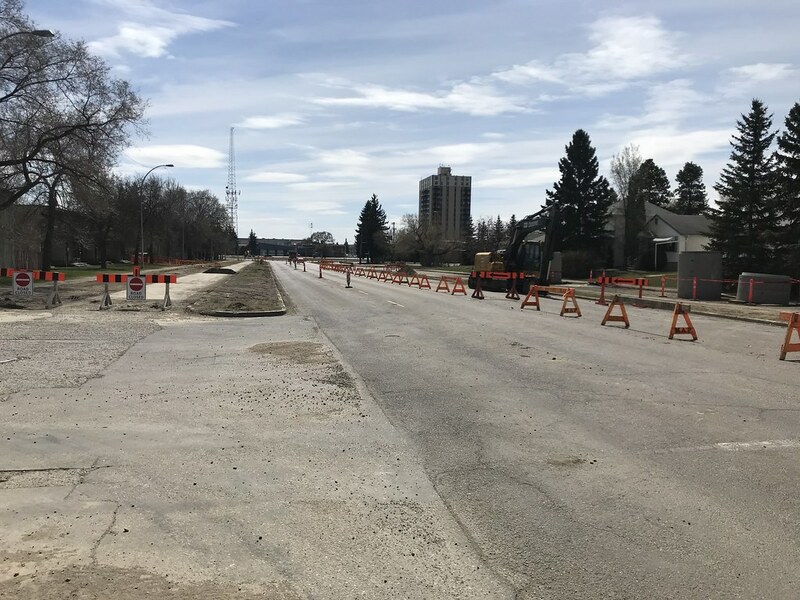 Roadwork underway on 85 St. 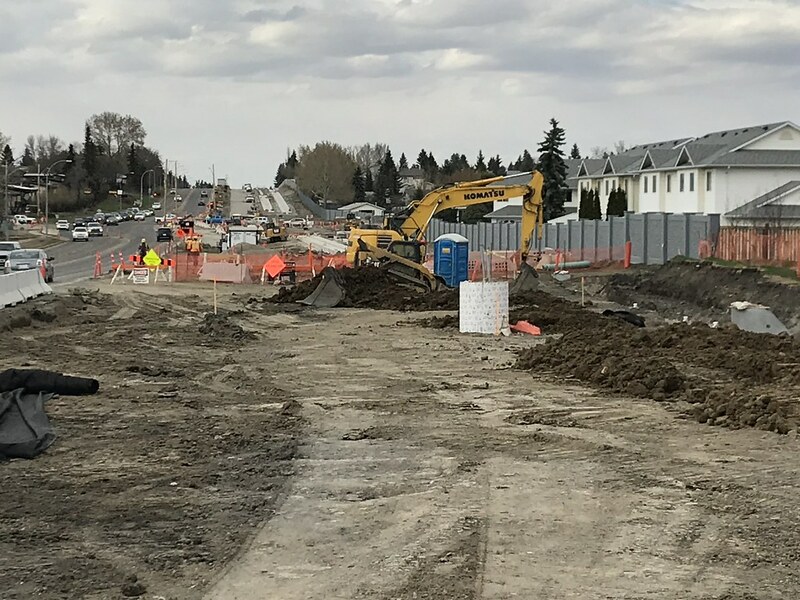 Looking north at 93 Ave. 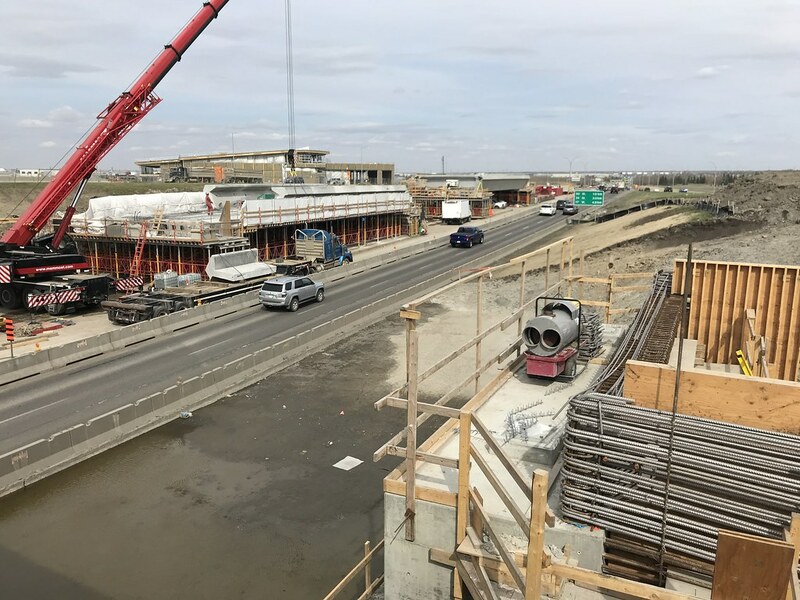 Looking south at 93 Ave/85 St. 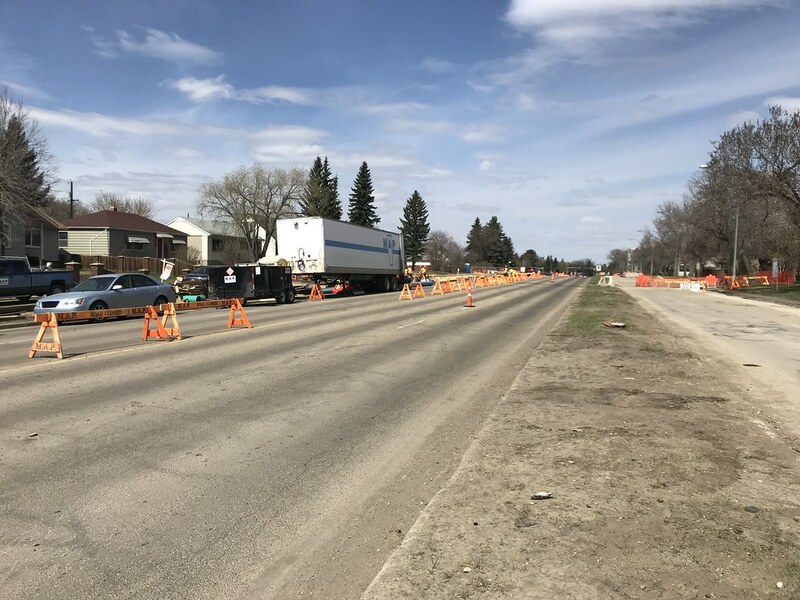 Looking south on 83 St just south of the Bonnie Doon traffic circle. 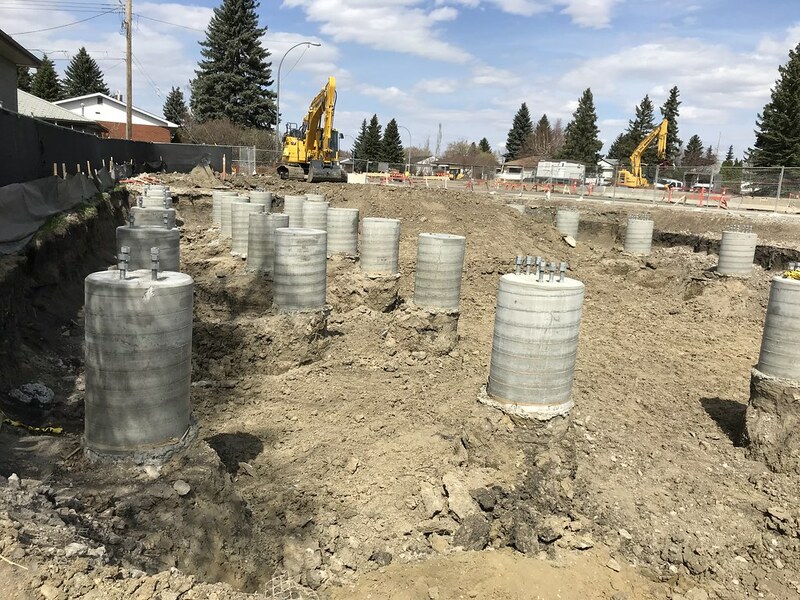 The foundations are in place for a traction power substation 86 Ave and 83 St.
Future Bonnie Doon Stop. Not much to see here yet. Cool stuff. Thanks for the pics Chris. 83 Street at 76 Avenue. They just removed the traffic lights a few days ago, and the traffic was moving slowly. People seemed to be confused. 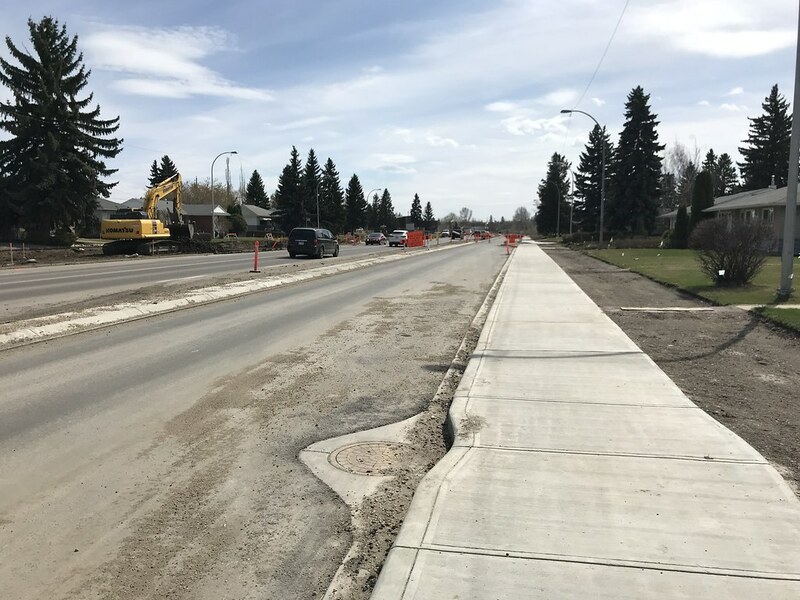 The final alignment of 83 Street southbound is complete for a few blocks south of 76 Ave.
Another photo of the final alignment of 83 Street, this time looking north. And one more, looking south. 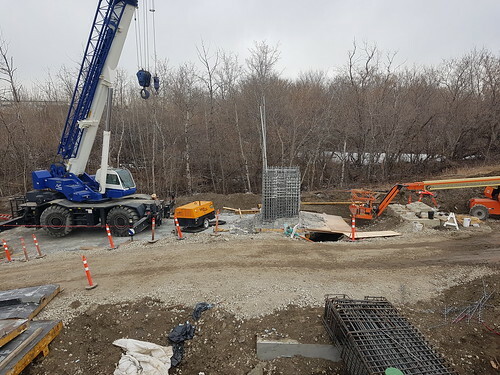 More foundations in place for a traction power substation. 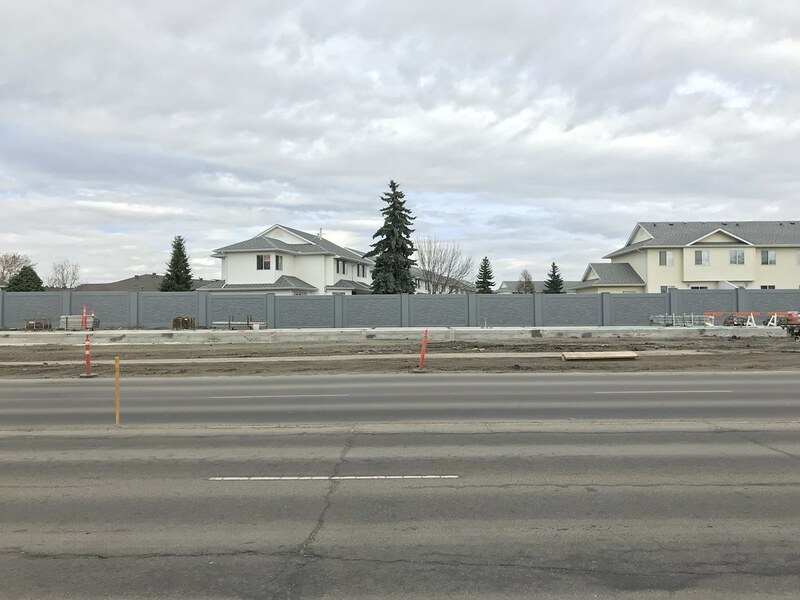 This one is at the corner of 83 Street and 69A Avenue. 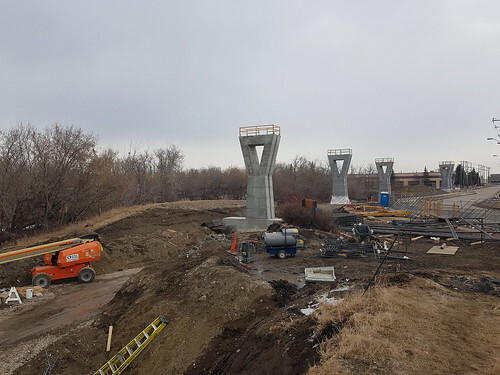 The piers are almost all in place for the elevated section of track between Argyll Road and 75 Street. This photo was taken at 83 St and Argyll Rd looking south. More piers are seen from Wagner Road and Davies Road. Davies Station as seen from 75 Street. 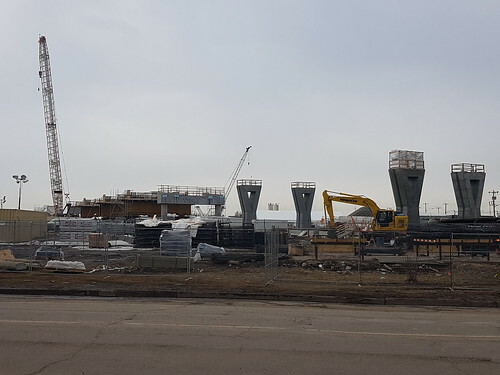 Bridge span fabrication underway at Davies Station. Looking south at 75 Street and CN's spur line. Looking south at 75 Street and Roper Road. 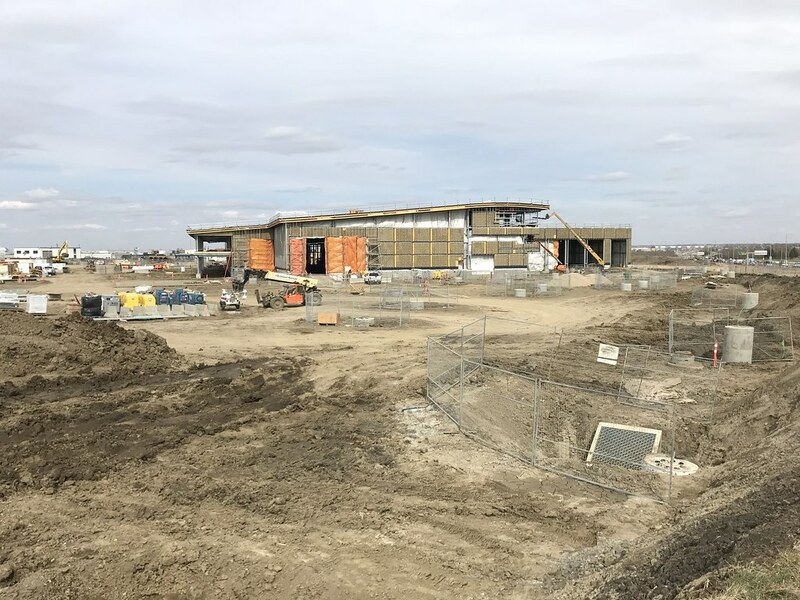 The Operations & Maintenance Facility is coming along. 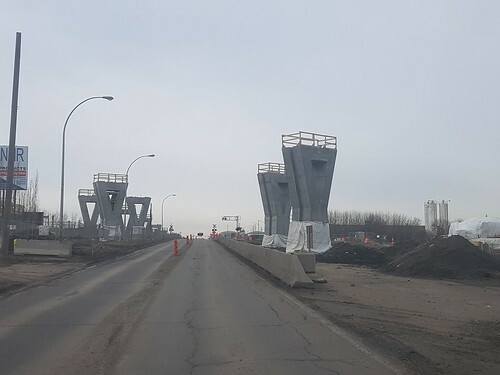 The bridge pieces are almost complete. I believe they are planning to move them into place very soon. 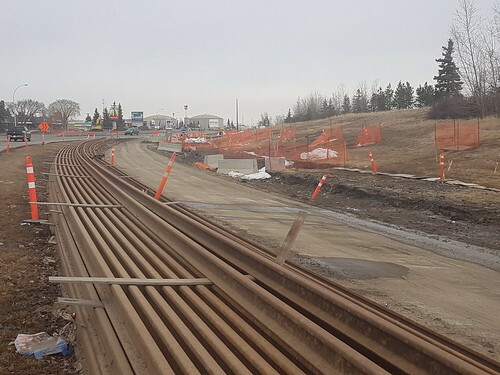 Rail just waiting to be laid! 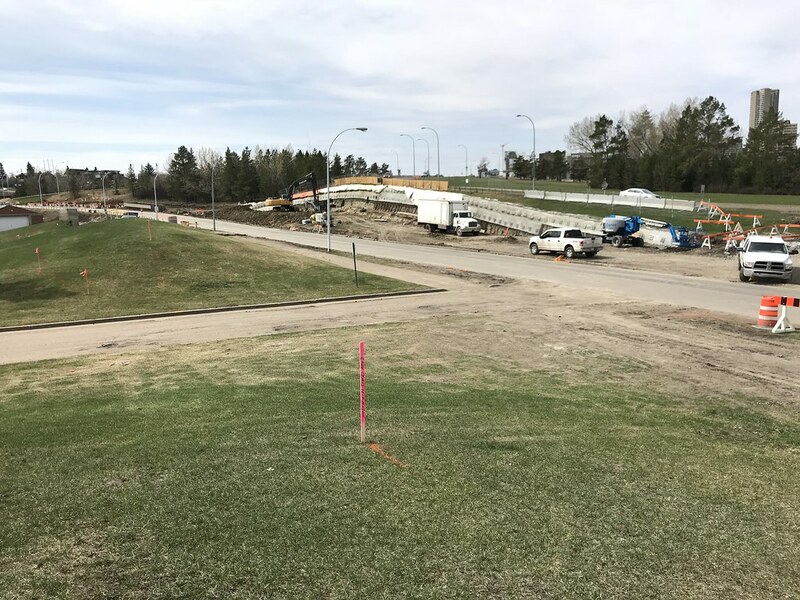 Looking north from 38 Ave/66 St. 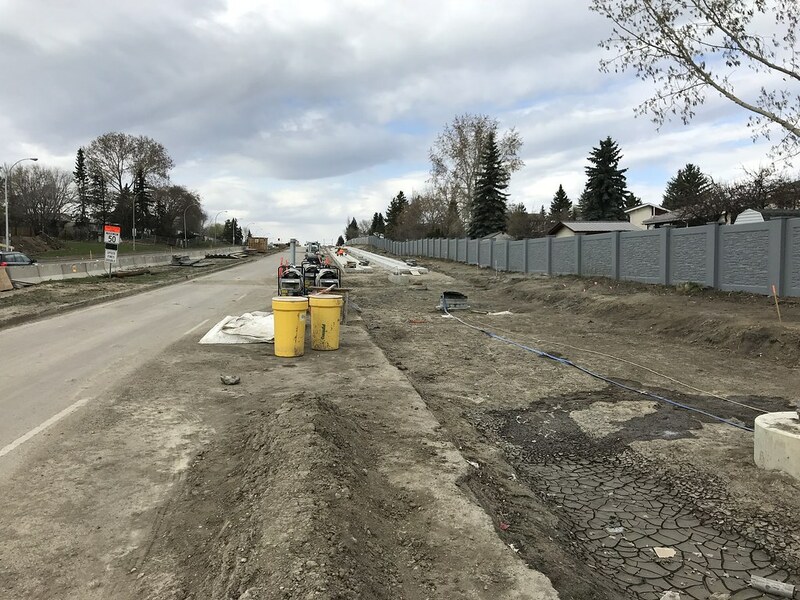 Looking south from 38 Ave/66 St. 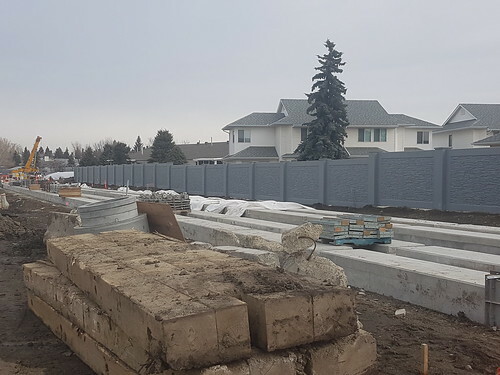 Looking north from 36A Ave/66 St. 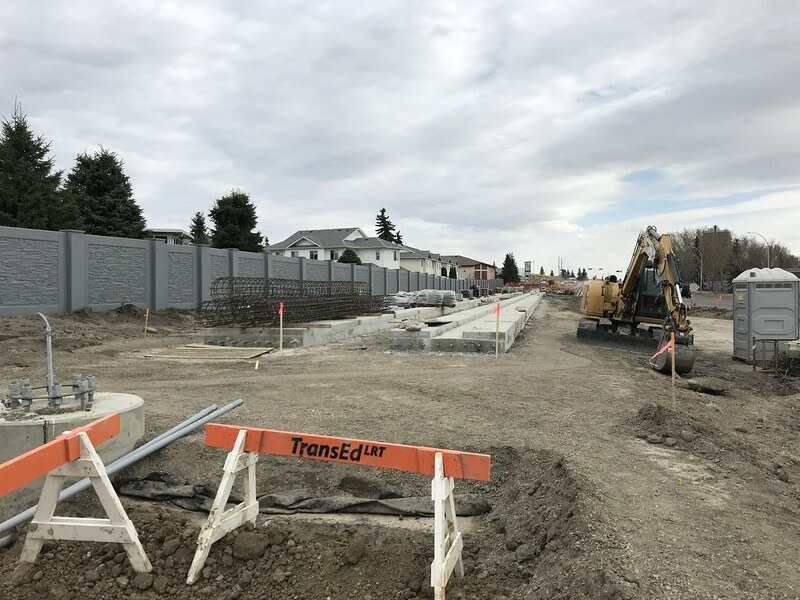 Looking south from 36A Ave/66 St. 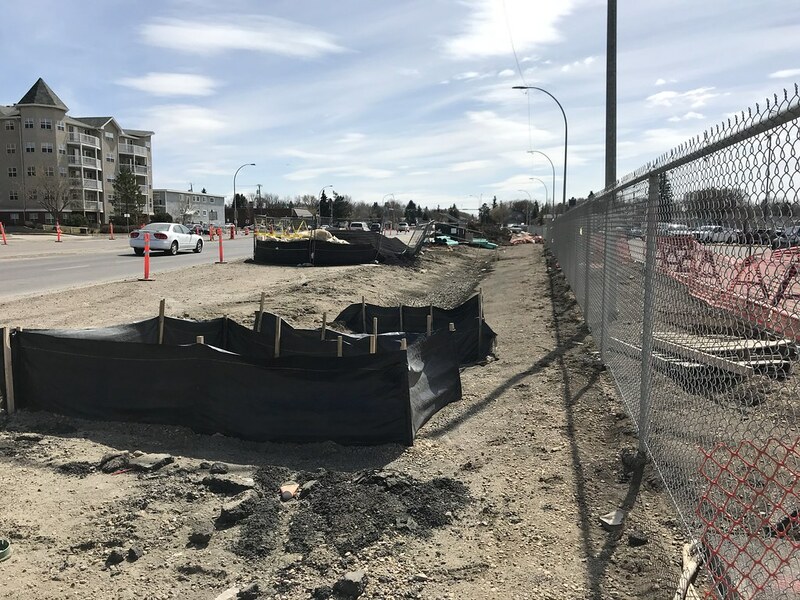 Looking north from 34 Ave.
Mid-block between 34 Ave and 31 Ave.
Crappy zoomed-in phone shot from 31 Ave. Shows clearly the path the LRT will take. 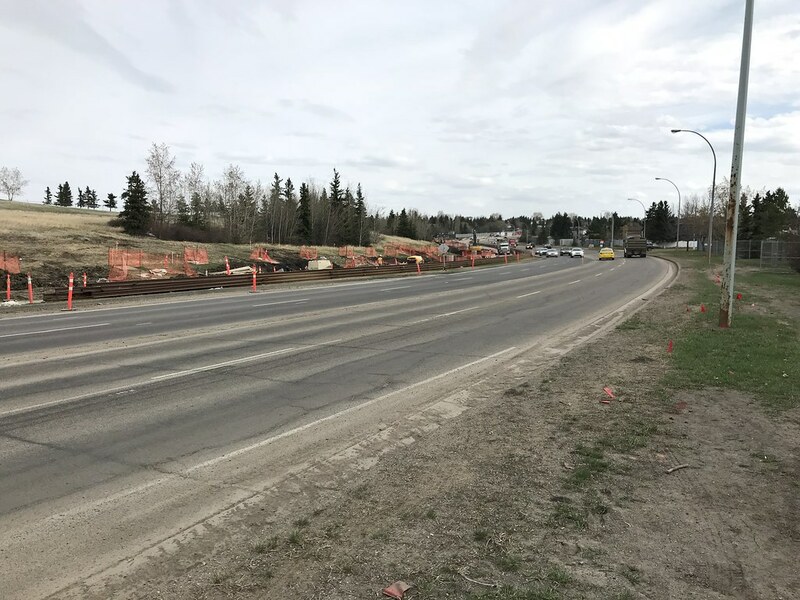 Looking south at 31 Ave/66 St.
And last but not least, the curve at 28 Ave where it will turn east and end at Mill Woods Stop. Sorry for all the photos!! Awesome! How long did it take you to walk all that way?? The devil made me do it. . 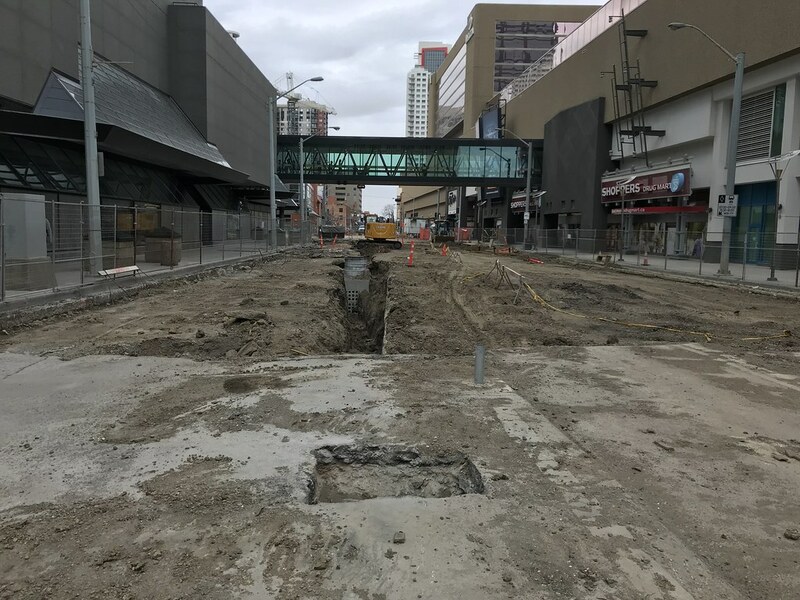 The sad thing is that the East Valley line will probably be finished before the Metro line to NAIT is fixed. I'm sure the multi-use path will come in handy. Great shots. Thank you sir. I'm not sure if there is a thread for this sort of thing and it is off topic. Pardon me but lately the Capital line lrt over the past 2 days has been running on 20 minute schedules after 9pm. Or earlier? I connect with an acquaintance every so often at Corona station about 9pm he works at one of the retail businesses nearby, and he said something about tracks. He said this would take about a week to complete. Anyone know anything? On Saturday, May 5, Capital Line trains will share Track 1 for both travel directions at University and Health Sciences stations. 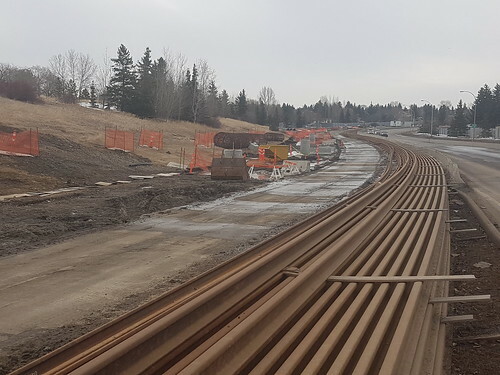 On Sunday, May 6, all LRT trains run every 20 minutes and Capital Line trains will share Track 1 for both travel directions at Coliseum and Stadium stations. Departure schedules will be adjusted. 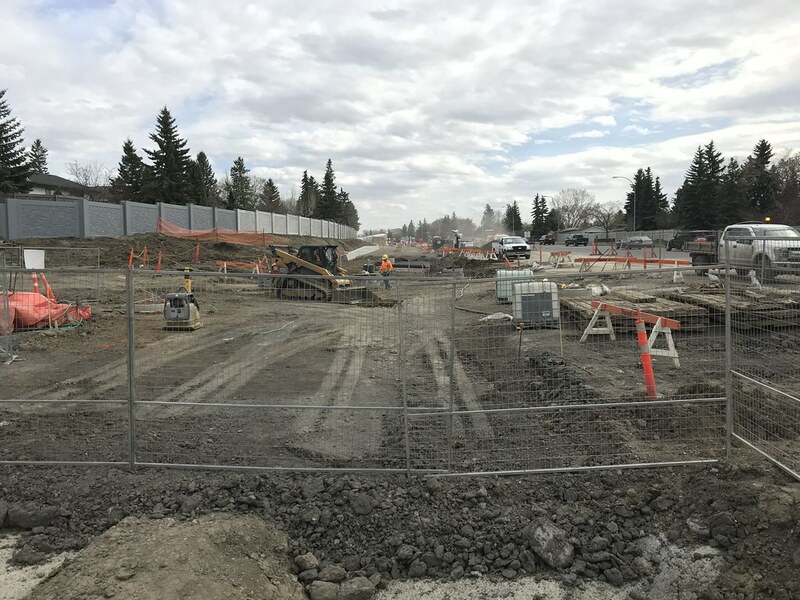 Nice pics, Chris V, though I'm curious about the status of the Bonnie Doon traffic circle and the Millwoods terminal. Excellent update Chris! How long did it take you to walk the whole line? 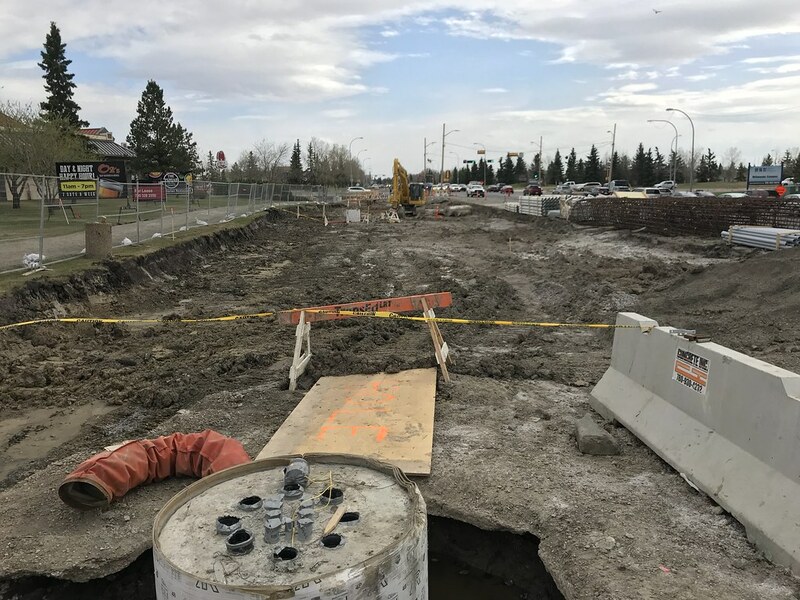 Bonnie Doon traffic circle is pretty much untouched other than some minor utility work. 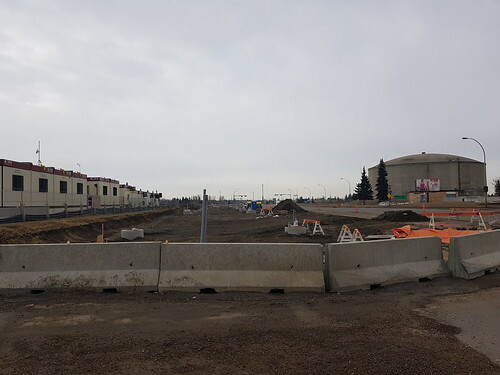 And if you’re talking about the Mill Woods transit centre, it’s untouched south of the library. Thanks for the kind words everyone! I’m going to try to walk the line in the spring and fall every year until the line is open. 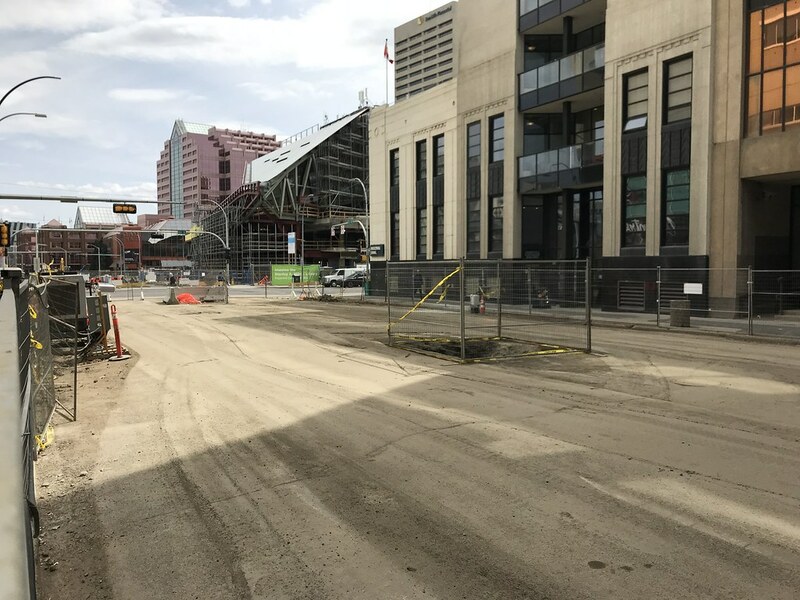 And as for how long it took, the first photo downtown was taken at 12:12 and the last photo at Mill Woods was taken at 17:11. Keep in mind I was taking my time though and stopped for a half hour break near the middle. Google Maps says I can walk the same route in about 3 1/2 hours. TransEd has a lot of work ahead of them if they want to get this done by 2020. Its only a year and a half away. Yes I can appreciate that everything is on a timeline and its all done in sections, but yeesh, that's 18 months away. The report on the Smart Card system said the line would open in December, 2020. Even still they're going to be pushing it. 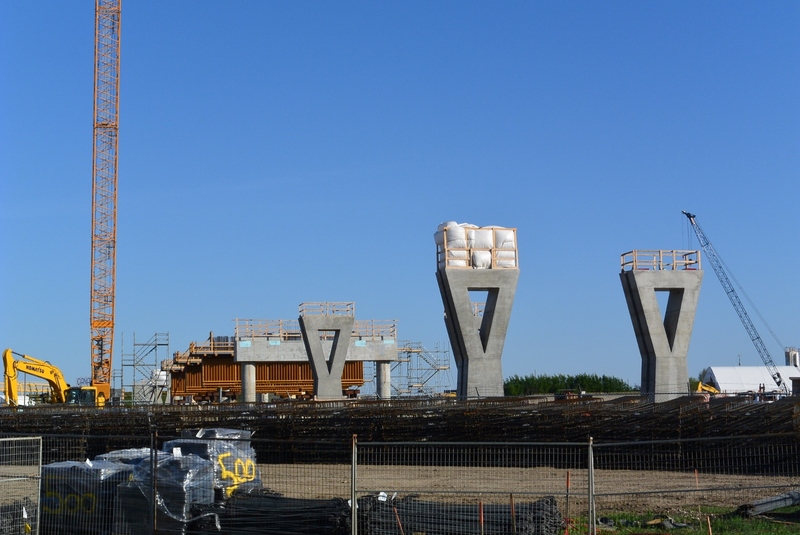 There's the bridge assembly, Mill Woods station, Wagner station. Plus they got to test the trains on the tracks, signaling before hand over. Testing trains. Can do that on a single weekend, right? Maybe, but these are low floor trains. A different animal. I was just going by the calendar year. I hope they get it done on time. This should never have started in the first place. How about that!? This should have headed West from the University along 87th Ave out from there. 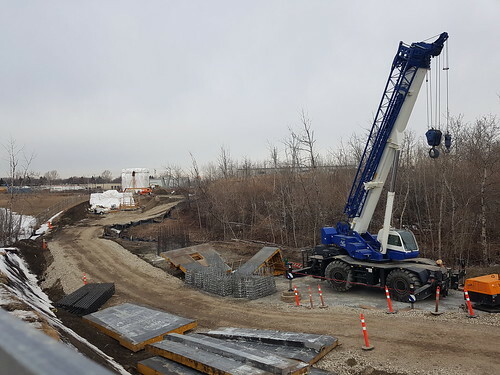 According to the city’s traffic disruptions webpage, the girders for the Whitemud Drive bridge will be moved into place this weekend. Thanks for all of the pictures. I'm enjoying watching the progress so much appreciated. I think the City is making a mistake using the term "stop" instead of "station". First I find it confusing. Second, stops are usually used for buses and trams. The so called "stops" have platforms (low floor of course), ticket machines, shelters, serve trains operating in a dedicated right of way. They're stations. I think the City should just call of them stations to be consistent with the existing LRT lines, avoid confusion, and avoid the perception of a slow stuck in traffic tram. ETS Trolley Buses - 1939 to 2010 - R.I.P. Umm the Mill Woods LRT will for a good portion be slow 35 km/h stuck in traffic, so stop is a very valid term. Sloth is also a very valid term. One thing nobody notices is that the low floor, slow streetcars have fewer seats and more standing room which is counterintuitive. Users will have slower transit times and be forced to stand the entire journey. 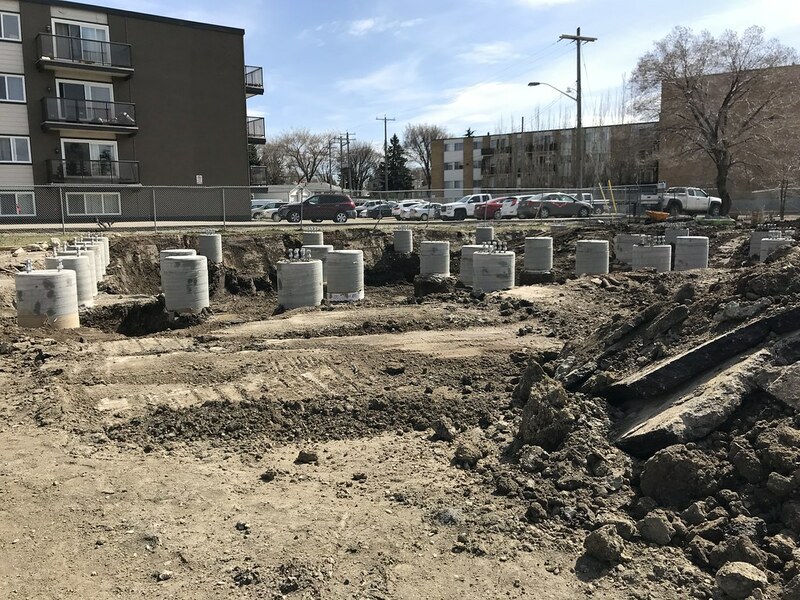 Last edited by Edmonton PRT; 12-05-2018 at 08:39 AM. Low floor doesn't have to mean slow though, if the stops were spaced out further, less level crossings on major roads, less tight curves, you can run it fast. Grey Nuns/Mill Woods, Strathhearn/Holyrood should have been only one stop each. 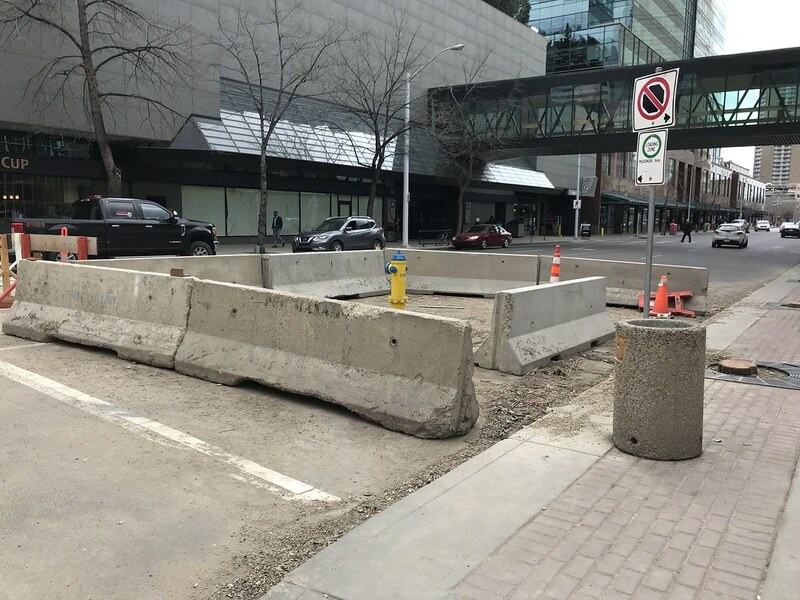 Any word on the original purpose of the concrete they drilled into? Last edited by KC; 12-05-2018 at 12:24 PM. 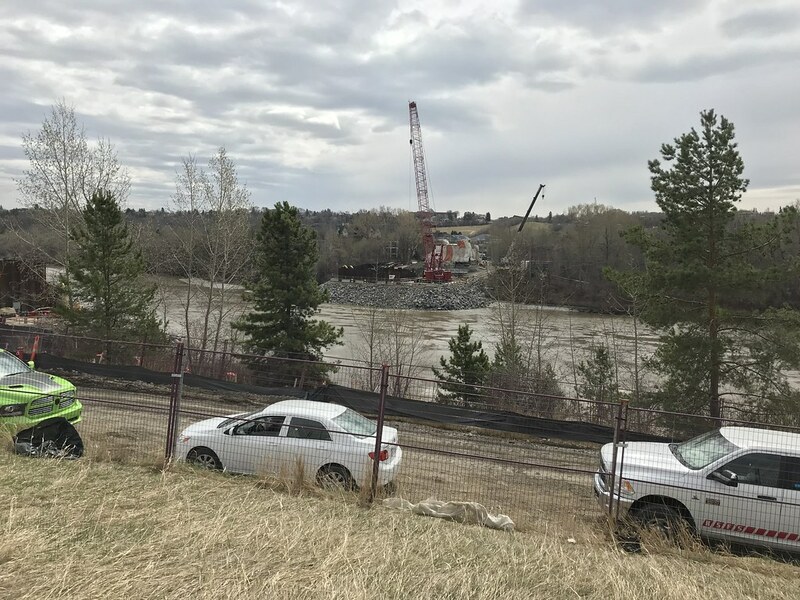 Went down to Whitemud Drive today, and the bridge hasn't been moved into place. Not sure what they did last weekend? Maybe it got delayed. Great picture of the Davies station. 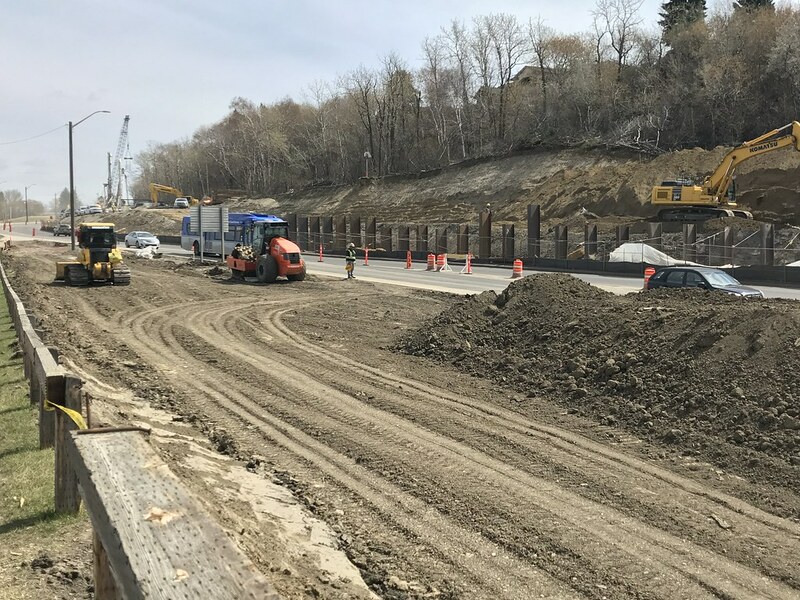 I think I saw a sign on Wagner Road indicating that work will be starting on May 29. What really annoys me is the picture with those beautiful elm trees at the Holyrood platform. They cut them all down. 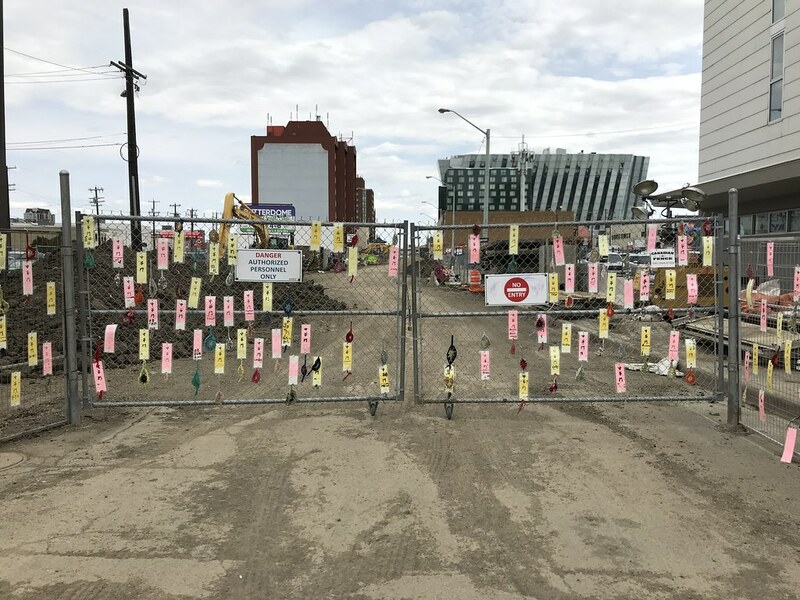 They did the same when they built the UofA Hospital station which was totally unnecessary. Cut down all the mature trees adjacent to the station and rebuilt the park mostly out of concrete. Total shame. Most likely just to justify paying landscapers as part of pork barrel projects. This is so ridiculous it's stupid, to be generous. Um, Trans Ed realizes that trees can be uprooted and repurposed somewhere else right? Please walk through uprooting and transplanting a mature american elm or green ash. Last edited by DanC; 20-05-2018 at 05:24 PM. It is possible the trees in Churchill square were transplanted from elsewhere as mature trees as were the elms in central Macdougal park. But then there are “mature” trees and then there are the ones in Hollywood that were at least sixty years old. It takes years of planning pruning the roots and canopy to manageable sizes. I don’t know but I would imagine the ones in Hollyrood would not have been worth the risk considering the cost involved. Trees will grow though, what bugs me is they are spending money on concrete trackbed, when ballast and ties would work fine. The money they spent on the trackbed could have been used for more bridges or tunnels.